Gr 6-9-Linda Delgado’s life is about to change. The 14-year-old has been living with her Aunt Elba in Arizona, going to school, spending time with best friend Julia, and working in her aunt’s small Mexican restaurant where the emphasis is on wholesome meals made using fresh ingredients. When her aunt falls ill and eventually closes her restaurant, Linda is sent to Pittsburgh to live with a distant aunt whom she has never met. When she arrives, she finds a large family headed by Sir Dad and Aunt Pat, and seven boisterous children-foster, adopted, and one biological daughter named Chloe who’s not pleased to have another addition to the family. Aunt Pat is a well known TV chef (Cooking from Cans) and creates all meals, both on TV and at home, using mostly canned ingredients-the total opposite of what Linda is used to. And she doesn’t want any help from Linda. Other challenges for the teenager include dealing with a gruff aunt and a somewhat distant Sir Dad as well as adjusting to a new family, a new school, new friendships, a budding romance, sibling rivalry, and more. 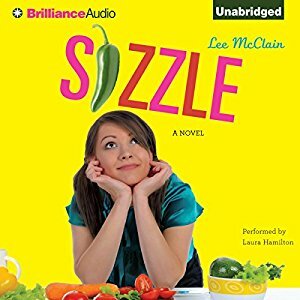 Laura Hamilton’s reading of McClain’s novel (Amazon Children’s Pub., 2011) is authentic, capturing the talkative energy and mostly funny voice of a likeable young girl, as well as the typical teen angst and drama. This appealing, lively story concludes on a feel-good note, complete with a recipe for delicioso empanadas at the end.-Mary Oluonye, Shaker Heights Public Library, OHα(c) Copyright 2013. Library Journals LLC, a wholly owned subsidiary of Media Source, Inc. No redistribution permitted. –This text refers to the Audio CD edition.